As our society begins to make its way into 2013, what once was seems to get lost in the present and completely forgotten in the future. However, there’s a hot rod shop dedicated to keeping the old alive and well through a culmination of hard work, skill, an eye for detail, passion and family ties. The Muro brothers own and operate Hot Rod Ranch, located in Lompoc, California. The brothers include, Gil, Randy and Jamie who each specialize in their own field of expertise when it comes to laying down frames, hand-made fenders and even flames. If this all sounds familiar, well, we’ve played this tune before when we met up with the Muro brothers last year at the Hot Rod Ranch Gasser Roundup – A culmination of pre- and post-war vehicles ready to drag it out. Make sure to read all about their second annual Gasser Roundup, here. If you’re into vintage steel, straight-axle tri-fives, tunnel ram intakes manifolds, magnesium wheels and rat rods, Hot Rod Ranch is certainly the Mecca of it all. This year, the boys were back at it again with their third annual Gasser Roundup, which included many of our favorites from last year with a few new surprises and newcomers. The Muro brothers have an open door policy and guess what? You’re invited. Their annual get together is full of octane and fellow gearheads. Of course, how do we know this? Well, we made the 400-mile trek north from our headquarters in Temecula, California to their Lompoc ranch where we met up with the Muro brothers and the Roundup. Unfortunately, we weren’t able to make their Friday night bash, which included a cruise and BBQ. We’ve already made plans for next year to make sure we’re there for the full ride. For now, enjoy the sights and sounds of the Hot Rod Ranch Gasser Roundup, which we attended on Saturday. We’ve made sure to cover the gamut of all the Ranch had to offer, including the cackle fest. We’ll let you in on a little secret: It’s well worth the drive so make sure to mark your calendars for next year. The Muro boys are already planning on for next years celebration; possibly at a different location to handle the ever-growing crowds and cars. Traditionally, car shows aren’t organized on an exclusive, old-country Ranch. However, not giving into conformity, the Muro boys made sure to conduct their annual car show on the very grounds they honed their car-building skills. To be honest, the location couldn’t have been a better fit. Arriving at the property, a one hundred year old Oak tree greets you, followed by an endless array of muscle cars, high-boys, rat rods and even an all-original, “Paddy Wagon,” which was restored by inmates in nearby San Louis Obispo, California. From there, the wide expanse of the property gives way to the barn-style shop with multiple bay doors, choked full of American classic iron, including a retro-mod Thunderbird equipped with a late-model, Ford Coyote 5.0 powerplant. As the day wore on, the vehicles were pouring in nonstop. Literally, to the point where vehicles owners were double and triple-parking on the property. Not taking away from tradition, Hot Rod Ranch also organizes a cackle fest towards the end of the day to help celebrate the event. The idea is simple: Start your vehicle and let it all hang out by stabbing the throttle; creating a rev-happy orchestra. While we missed the opportunity last year to get video of the celebration we made sure to record the fun this time around. Check out what we captured below. We’re sure you won’t be disappointed (Editor’s note: Turn up the volume). Showcasing just how detailed the Hot Rod Ranch can get, Hot Rod Ranch featured their custom-built pedal-cars. These hand-built cars are really something to see and feature as much attention to detail as the life-size cars they build for customers. In this case, each pedal-car is purchased and built to support the local Special Olympics. Local shops in the area then customize them as necessary and donate them to charities. Last year, Hot Rod Ranch unveiled, ‘El Greengo’ into a period-perfect gasser. This year, Hot Rod Ranch upped the ante by building a two-seater roadster, complete with custom front axles, headers, period-correct wheels and tires and even a roll cage to protect the driver. All said and done, these little pedal-cars features nearly 80 hours of labor and a custom paint job to set it off. Evidence of their handy work, this front axles was hand made for the pedal-car. Much like most car meets, the boys from Hot Rod Ranch wanted to make sure their annual event had everything for everyone. This year, they made sure to even include a small swap meet. 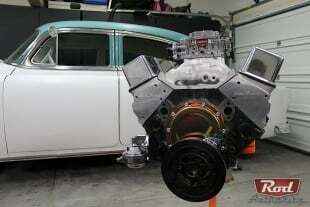 It included all of the swap favorites including, hard to find vintage parts, stock to mild iron Chevy cylinder heads, mag wheels and antique high-rise intake manifolds. The Hot Rod Ranch Gasser Roundup has it all, even a complete swap meet to discover those hard to find parts. Truly, one of the more unique vehicles at the Roundup was the Four Screen Express “Paddy Wagon.” Abandoned years ago in a Goleta neighborhood, on its way to be reclaimed by Mother Nature, the Dodge was resurrected by County Vehicle Abatement. It was then stored behind the County Garges in Santa Barbara county until it could be disposed of. Spotted by Sheriff Deputy, Juan Tejada, and despite its dilapidated condition, Tejada knew it deserved more than to be destroyed. From there, Tejada began the process of restoring the old Dodge back to the original condition. The California Men’s Colony in nearby San Luis Obispo, California took the responsibility of the project. With a full service automotive section as part of the rehabilitation training for inmates, it was a match made. By 1988, the Dodge was delivered and by the fall of ’90, the Paddy Wagon was ready for the road. Since then, the Paddy Wagon has made its way up and down the California coast all the while flying the Sheriff’s department colors. Concluding our experience at the Hot Rod Ranch Gasser Roundup, we couldn’t have been happier to cover the event. Honestly, you couldn’t find a more genuine group of experienced car-builders to handle anything from a basic touch-up to a full-tilt, ground-up restoration. Be sure to check out their website and join their Facebook page to receive updates on all of their latest projects. The event doesn’t stop here. Make sure to check out the high-resolution gallery below! Ready for the salt flats? Just check out the attention to detail of this '56 Nomad; complete with white wall tires and lake pipes.